As forme, I decided right when I begun (in 2013) that I would diversify my activity by proposing you knitting accessories besides my knitting pattern because I knew I couldn’t make a living with only the knitting patterns. That diversity is what has allowed my activity to cover itself for the last 3 years. My earnings cover my business expenses (insurance, website, yarn, axposing at some yarn events), which is already not that bas, I know it, but I’m not paying myself ! I’m lucky to have a husband who supports me, but I’d like to bring back some money home too, more regurlarly… Moreover, I have so many more ideas I’d love to develop for Instants de Louise, but I can’t do so if my activity doesn’t bring more earnings… I have benn thinking a lot about it, for a while (over 1 year) and I decided to implement 2 solutions to get there. Today, I’m going to talk about the first one : raising my knitting pattern prices and I’m going to explain you why. Why raise the prices of my knitting patterns ? This deicision has been on my mind for a long time, as I was seeing other knitwear designers do so. I was decided to do it, but I couldn’t bring myself to set a date for it. I also wanted to explain you why, which implied to write a post, and it seems I couldn’t put words on it, until I saw a article posted recently by Thread and Ladle. This was the impulsion I needed to finally attack the subject, write this article and assume the price raise. Some might scream that my pattern prices are already expensive, that for the same price, they could buy a magazine with multiple patterns in it… Yes ! True, but those magazine have a big teams, big communication team, big diffusion services (ans we don’t know how the pay the designers). Me, I’m alone behind Instants de Louise and I’m trying my best here. Let me show you. 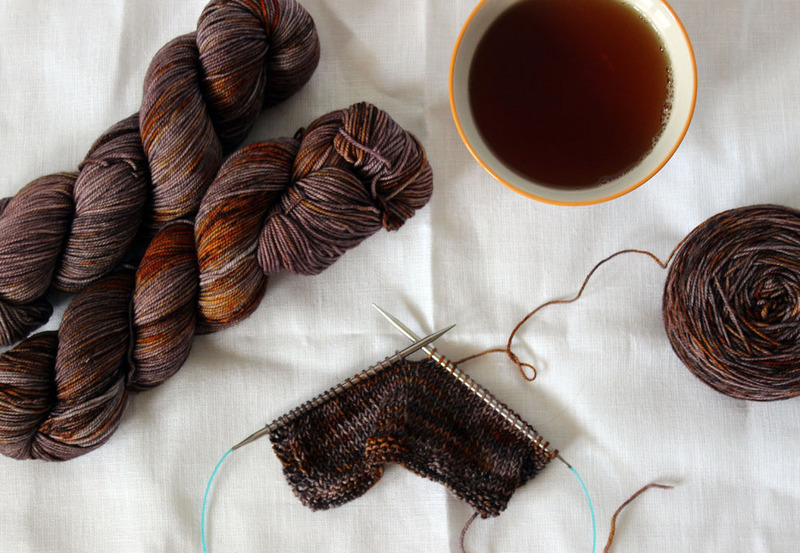 What is necessary to make an Instants de Louise knitting pattern ? At first, there is an idea, a small sketch in a note book, a yarn that stroke my inspiration or a stitch being I really want to use… The inspirations behind a knitting pattern may be pultiples ! From this general idea, I then need to knit a sample. Usually, I buy the yarn I need. From time to time, I’m lucky to create a pattern in partnership with a yarnstore who offers me the yarn, but it is not everytime (far from it). Once I have the yarn in my hands, I swatch and do some maths (sometimes quite complex, sometimes not, depending on the project). Then I can dive in the most fun part, knitting ! This when I can trully realise if the idea I had in my head works, if it is as nice as I had imagined it… Sometimes it works, some other times, it doesn’t and I have to frog it and startd all over again… This can take a lot of time ! While I knit my sample, I also take some notes about what I’m doing : the different steps, some numbers, without getting into details. It is very far from the final file, but they are really important for me : some time can pass between the sample knitting and the actual writting… They help me remember what I have actually done when I finally write the pattern. Next, it’s really time for me to sit down in front of the computer for a while. When necessary, I do all the gradation maths. I have big spreadshits, with lots of calculation, for all the sizes… Some designer doesn’t like this step. I kinda enjoy it : I love maths ! I fond it stimulating ! While I calculate all the stitches and rows numbers, I also estimate the yardage for each size. When all the math is done comes the time to actually write the pattern. This is when the few notes I took while sample knitting really hemp me. Writing a pattern is an important work, as I write the pattern in French and in English. Twice as much work ! When I write the pattern, I try to make the explanations as simple and clear as possible. It is important to me that they are complete, clear and understandable for a large amount of people : it means happier knitters and (potentielly) less pattern support afterwards. I stay on the computer to do all the schematics and the charts (when necessary) on specific softwares. When I think the pattern is ready and after proofreading it several times, I send the files to tech editing. My two tech-editors (one for the French file, one for the English one) bring fresh eyes to my work and their job is to control everything : the maths, the counts, the spellings, the extra spaces, the inconsistencies. They point out what needs more explanations. They check the measurements… They do a thorough proofreading of the pattern so that I can offer you the best pattern possible. Then it’s time to have the pattern test knitted. If they want to participate, my test knitters have to knit the pattern during the allocated time and report to me every questions, comments and errors they could meet during their knitting time. Like the tech editing, the test knit brings fresh eyes onto my work to control everything is ok. My test knitters don’t have any obligation toadvertise about my pattern when I publish it. If they do, I appreciate it, but I don’t impose it on them ! when their project is done, they can do whatever they want with it, it is theirs. When I publish the pattern, I also send it to my test-knitters. What are the costs of creating one knitting pattern ? To begin with, let’s have a look at all the expenses I have for creating a pattern (material and services) and for running my business. Then, there are all my expenses to run my business : bank, professionnal insurance, website, communication(business card…), from timt to time, I also need some new needles or haberdashery and some documentation. those fees are up to 1200€ per year, to distribute on all the knitting patterns I publish in one year. Let’s consider that I publish one knitting pattern a month. My annual business expenses are divided between the 12 patterns, up to 100€ per pattern. How much pattern do I need to sell to cover the costs ? You need to know that the expenses I presented you above are not the only ones. For every sale, I have to deduce different fees : Ravelry, Paypal and my social and welfare costs. That means that, when I sell a pattern 5 €, ~3.5 € remain after deducing those fees ; 4 € remain for a pattern I sell 6 €. If we look back at our shawl pattern example above, when I sell a shawl pattern 5 €, I need to sell 57 to cover the costs, without paying me for the time spent creating the pattern. For an adult garnment pattern sold at 6 €, I need to sell 68 to 90 to cover my costs before thinking to pay myself. I can tell you that not all my patterns sell up to thoses numbers, or really slowly (while the expenses are quite close in time). what if I count the time I spend creating a knitting pattern ? That makes a total of 30 to 41.5 hours to create a shawl knitting pattern. That means I need to sell 66 to 91 additional patterns, bringing the total to 134 to 181 5€ patterns to cover my costs and pay myself at the minimum hourly wage. That makes a total of 57 to 74 hours of work to create a simple adult garnment pattern. That means I need to sell 109 to 141 additional patterns, bringing the total to 177 to 231 6€ patterns sold to cover my costs and pay myself at the minimum hourly wage. After all those observations, I decided to raise a little bit my patterns prices to take in better account everything that goes into creating a knitting pattern. that doesn’t mean the prices will double, far from it ! But a small increase of all my prices and some standardization between my patterns would allow me to cover my cost a little bit faster and so to be able to pay myslef a little bit faster too !